As a new graduate of veterinary school, I took my oath to ease pain and stop suffering very seriously. There is a moment when a new veterinarian realizes the power and responsibility this profession has. That moment when the solution to a problem isn't something that can be found in books. That moment came for me when I met Kona, a mountain lion. Kona's oven-mitt paws had been declawed and the result was he had tremendous pain with each step. He suffered when he moved. There were other big cats who were crippled too. Declawing is amputating the toe bones. I was their doctor. It is a potentially devastating surgery. What was I going to do? Repair these paws and the damage as best as we possibly could seemed to be the only solution. The repair was remarkable. It was beyond my hopes and expectations. It was exciting. The big cats were walking after surgery and there was very little evidence of the pain that was so obvious from before. I felt like a TV Evangelist pressing these animals on the foreheads and saying, "Heal!" Tigers, lions, jaguars, bobcats, lynxes, servals, leopards and cougars - all of them were getting better. An African lioness had her paw repair surgery and we bandaged her feet in dark green wrap. 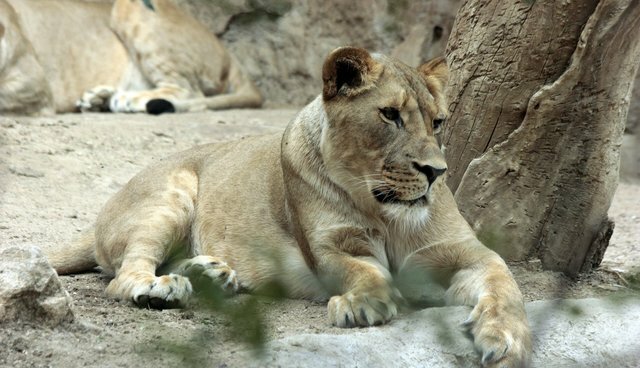 Most cats don't like anything on their paws, and lionesses are no exception, but Naala kept her bandages on for a week after repair surgery. It was as if she felt her new "shoes" were making her feet feel better. We tried to get them off but she wouldn't let us. They were hers. Bandages can only stay on for short periods of time without potentially causing damage to the limb within them. The day that we had schedules to knock her down to take them off came and that day, I had a visitor. He had been sent to me by our mutual friend, Jean. The two of them had recently rescued a declawed cat who had been dumped in a local parking lot. That's why they were discussing declawing and that's why my visitor, Hernan Molina, deputy to the Mayor of West Hollywood, John Duran, was there that day. I looked at Naala and I looked at Hernan and put the two together. I said, "Why don't we make it illegal to declaw cats in West Hollywood?" Little did I know that that request would change my life forever. Here I am 14 years later and declawing is now illegal in West Hollywood, Los Angeles and six other cities throughout California. I hope that one day I'll be writing about how declawing stopped across the nation and then I can be on to my next fight. Until then, one step at a time, until no step is painful for any cat.